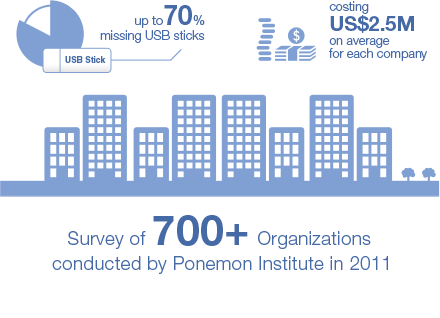 Based on a recent survey of 700+ companies, missing USB sticks represents 70% of all data breaches, costing US$2.5M on average for each company. Velosti Technology offers the most comprehensive security solution, authenticating both users and computers simultaneously. Our hardware AES-based encryption engine provides superior security while experiencing true USB 3.0 throughput. Unlike traditional password-only security solutions, our proprietary UCA (User-Computer-Authentication) security algorithm does not depend strictly on your password strength. Instead, UCA technology supports concurrent user and computer authentication. In other words, authorized users can only access their sensitive data in registered computers. All storage data are encrypted using an AES cipher key, which can only be calculated using authorized user passwords and registered computer signatures. Our proprietary patent pending UCA technology can support multiple users and multiple registered computers, suitable for both personal and enterprise applications.